We’ve previously discussed the importance of proxy voting on EOS. 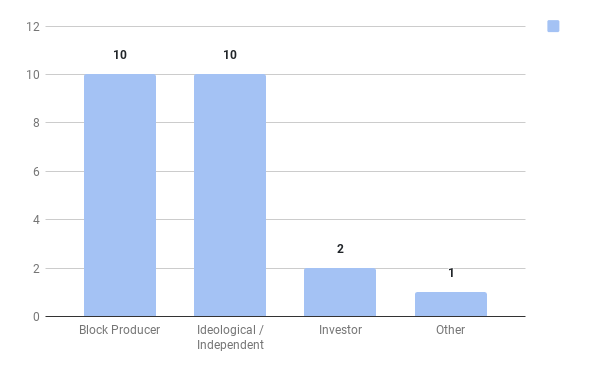 Many voters, especially those with relatively small EOS holdings, cannot be expected to actively participate in network governance. Proxies are the parties that participate in governance on behalf of those users and thus play a very important role in the EOS ecosystem. Here at Aurora EOS, we monitor the state of proxy voting very closely, as we think that the development of a large and varied ecosystem of proxies is one of the most positive developments for the health of EOS governance. This article will take a look at the current state of proxy voting on EOS along with some visuals, data, and insights. We hope that it serves as a snapshot of the proxy ecosystem at this point in time so that we can monitor, both quantitatively and qualitatively, how the proxy ecosystem develops. Block producer Aloha EOS created an EOS Proxy Info contract that allows proxy accounts to publish information about their proxy on-chain. The options for data include not only information about the proxy and its voting philosophy, but also affiliations, website, and various channels through which the proxy can be contacted. The great thing about having this information on-chain is that it can be queried by any number of services, including block explorers, dedicated vote trackers, and more. The data is stored in the “proxy” table in the regproxyinfo account. While anyone can create a proxy account permissionlessly and even anonymously, the proxy info contract is strongly encouraged by the community for anyone creating a public proxy. It signals a proxy’s intent to participate in the EOS community as a public-facing, representative voter. For purposes of this article, we’ll mostly focus on proxy accounts that have registered with this contract. One important thing to note is that a large number of votes go through proxies due to the use of proxies by exchanges. Many exchanges like Bitfinex and Huobi allow users to vote for BPs from within the exchange but use proxies to actually cast those votes on-chain. As a result, many of the largest proxies on EOS are simply vehicles by which exchanges log their customers’ votes. Here we’ll focus on non-exchange proxies that have more than 100,000 EOS in voting power behind their account in order to highlight the growth of proxies with significant voting power. We hope to see many more proxies in the future with even more significant voting stake. In our first article about proxy voting, we analyzed the different types of proxies that exist (exchange proxies, ideological/independent proxies, dApp and enterprise proxies, and BP proxies) and made some predictions about how those would develop. We’ve already seen exchanges and block producers become active in the proxy scene, but we’re also seeing more proxies run by dApps, enterprises, investors, and even completely independent parties. One extremely positive development we’ve seen is the emergence of independent, third-party block producer ranking services. One that recently debuted and already has over 100,000 EOS behind its proxy is Mereo. Mereo describes itself as a block producer ratings platform. Its website maintains a list of EOS block producers along with a detailed description of its methodologies and in-depth scoring for various categories that define a good BP. These services are extremely important for the EOS community, as they provide open-source criteria for evaluating block producers. EOS token holders can use these methodologies to cast their own votes, or they can even more easily proxy their vote to one of these watchdog services (for free) and know that the organization is doing detailed diligence on their behalf. We hope to see the reach of Mereo grow, and we hope to see more organizations like Mereo and EOSRatings emerge. Finally, we’ve seen two major investor proxies emerge, run by Investing with a Difference (IWAD) and Mentor Market. Proxies are a great tool by which investors can increase their own influence within the EOS ecosystem and protect the value of their investment. We haven’t yet seen and major crypto funds or institutions announce proxies, but we do think this is highly probable. 260,581,320 EOS are currently voting. There are currently 516 proxy accounts on EOS. Of those, 94 have registered using the proxy info contract. 78 proxy accounts with more than 100,000 EOS voting power. 51 proxy accounts with more than 500,000 EOS voting power. 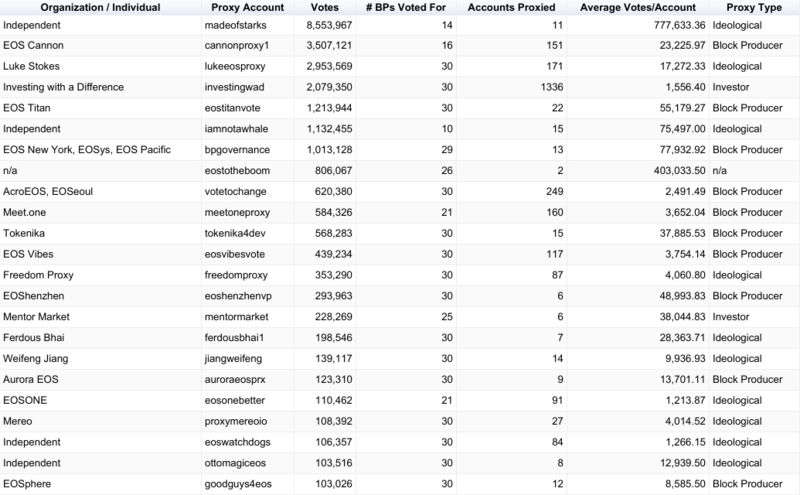 41 proxy accounts with 1M EOS or more voting power. 2 proxy accounts with more than 5M EOS voting power. 23 proxy accounts with more than 100,000 EOS voting power. 10 proxy accounts with more than 500,000 EOS voting power. 7 proxy accounts with 1M EOS or more voting power. 1 proxy account with more than 5M EOS voting power. Below is a table that lists every registered proxy with more than 100,000 EOS in voting power. There are a few variables to pay attention to here that can tell us different things about the health of the proxy ecosystem. Feel free to play around with the data here. The first variable is simply the number of votes behind the proxy. Currently, the largest proxy (madeofstarks) has ~8.5M votes. This is a significant amount of voting power. For reference, the difference between the #21 and #22 BPs is 366,946 votes. The difference between the #1 BP and the #21 BP is 24,581,108 votes. Depending on where a BP stands in the rankings, this account alone could theoretically remove a BP from the top 21 or significantly alter the rankings by revoking or changing its vote. However, as we can also see, this account is an outlier, and there are only a few proxy accounts that hold meaningfully significant voting weight. The second variable is the number of BPs that the proxies are voting for. Recently, there has been a discussion over whether to increase the limit beyond 30 BPs. EOS Cafe Block wrote a great article about the subject. We encourage all users to vote for the maximum 30 BPs allowed, and we believe that increasing the allowed number beyond 30 would be very healthy for the EOS ecosystem. 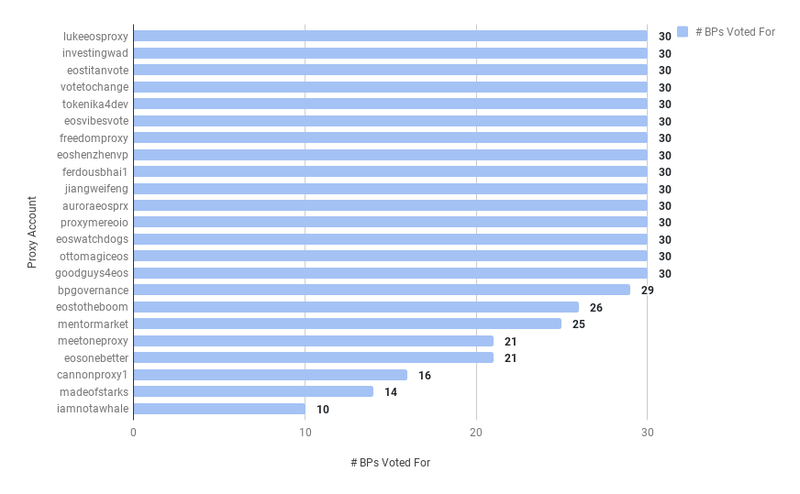 As we can see below, there are quite a few proxies with significant voting power that are voting for fewer than 30 BPs. 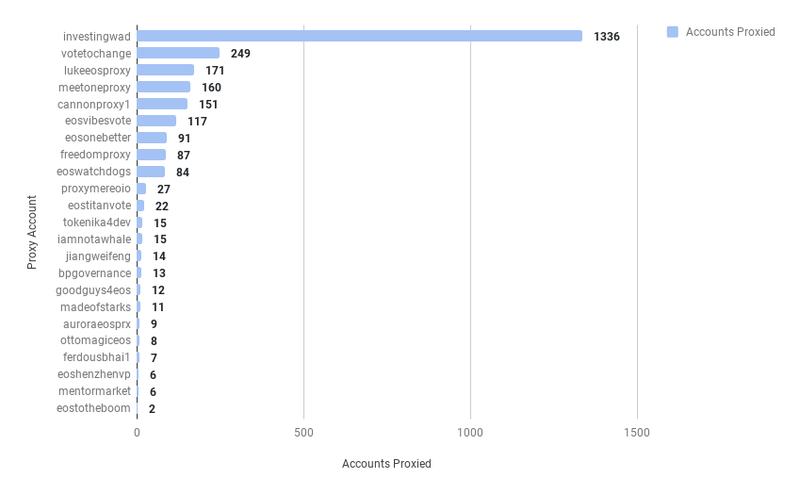 The third variable is the number of accounts that have proxied their vote to that proxy account. This number is somewhat gameable, since it is entirely possible for an individual to have many EOS accounts, but it is a good general indicator of voter participation in proxies. The higher this number is, the more individuals have decided to use that proxy to vote on their behalf (in theory). We’d like to see this number increase significantly as time goes on, as a healthy proxy ecosystem will have many large proxies that represent the collective interests of hundreds or thousands of individual token holders. The table below shows that Investing with a Difference is the clear leader in terms of support by individual accounts. Several others have significant support, but we can see clearly that many of the largest proxies currently on EOS currently receive votes from only a few accounts. This is not necessarily a bad thing, but we believe it shows that EOS proxy voting is still nascent and that many voters are unaware of it as an option. 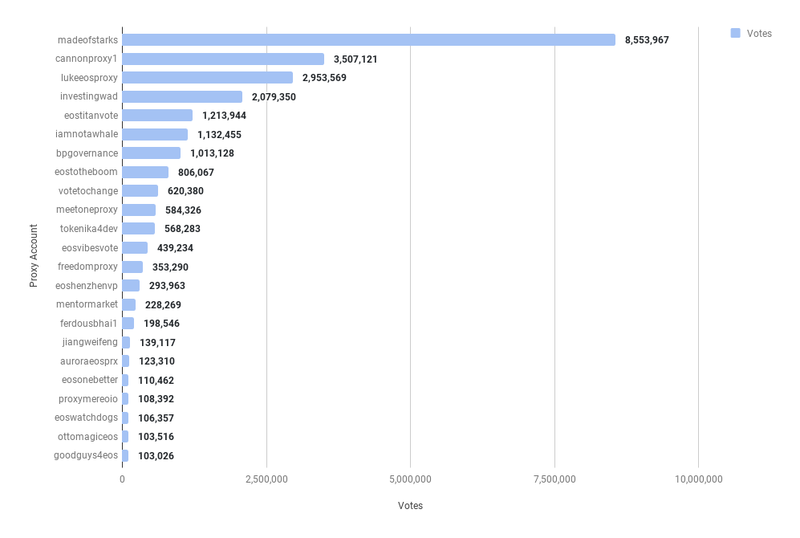 Among these top proxies, only 2,613 unique EOS accounts were proxying their votes, and 1,336 of those were from IWAD alone! We’re working hard to increase knowledge of the EOS proxy voter system, and we encourage all EOS community members to encourage more voters to take advantage of this great feature of the EOS software. Finally, we looked at the type of proxy as well as any organization or individual that the proxy is associated with. In our article about proxy voting, we categorized four major types of proxy voters. As we can see, block producers still hold a lot of weight in the proxy ecosystem. Given that proxies are tasked with overseeing block producers, we hope to see more growth in other categories in the future, as well as growth in the total numbers seen here. The data above seems to point towards two major conclusions. First, the EOS proxy ecosystem is still very nascent. The idea of on-chain governance is still very new to many in the crypto ecosystem, and the idea of liquid, delegative on-chain governance is even newer. Ignoring exchange proxies, there are only a few proxy accounts with significant voting weight and very few EOS accounts actively participating in the system. We believe this situation can be improved through education that makes more users aware of the system and tools that make it easier for them to participate. The second clear trend is that block producer proxies still carry a very significant amount of weight. There are very legitimate reasons for block producers to run proxy accounts, but a truly healthy proxy ecosystem should have many non-BP-affiliated proxies keepings block producers in check. This is why we’re excited about the rise of independent, public proxies like IWAD, Mereo, and Freedom Proxy. We will continue to monitor the EOS proxy ecosystem closely in order to offer insights and updates on its development. Note: EOS is a 24/7 liquid democracy, and any of these numbers may change at any given moment. This article is intended to serve simply as a snapshot of the current situation as of 10/17/2018. Thanks to Aloha EOS, EOS Authority, EOS Mediterranean, EOS Cafe Block, and HK EOS for their incredible tools that help make this type of analysis possible.